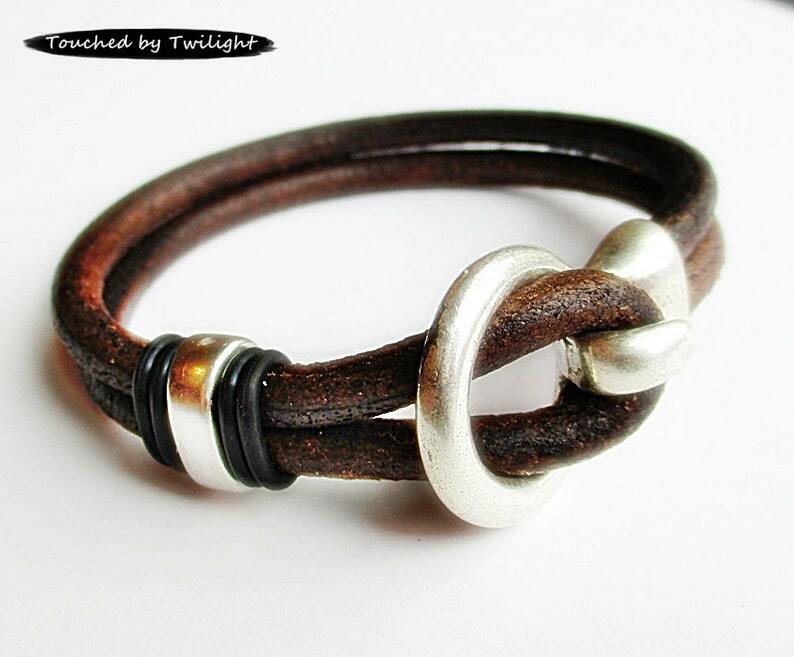 This simple, yet elegant, bracelet is handcrafted from double strands of soft and flexible 5mm distressed dark brown Euro licorice leather with a distressed antique silver hook clasp as its focal point and an antique silver slider bar surrounded by black rubber o-rings. SIZING: The sizes shown are the inside diameter of the bracelet when closed. The hook holds the leather loop securely so this bracelet can be worn either loosely as a bangle or as a bit more snug cuff-type bracelet. 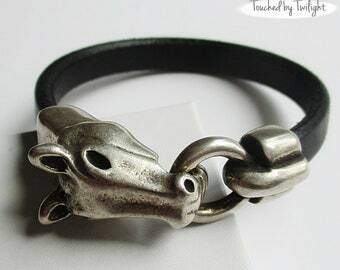 So, the size you order will depend on how you wish to wear the bracelet. I only "stock" a few sizes and if the size you need is not listed, just let me know. I can make any size you need . . . .
A word about my cord . . . It is genuine leather that has been dyed and cut. The dye is lead and chromium free, and complies with all EPA regulations. As with most dyed leather, the dye is not 100% colorfast. And, as with all genuine leather, after repeated use it will begin to show wear, especially around the loop that closes the bracelet. This only adds to the charm of the piece but it can be touched up with a black Sharpie marker if you wish.